Buy a premium lead list of thoracic surgeons and master your next medical marketing campaign. 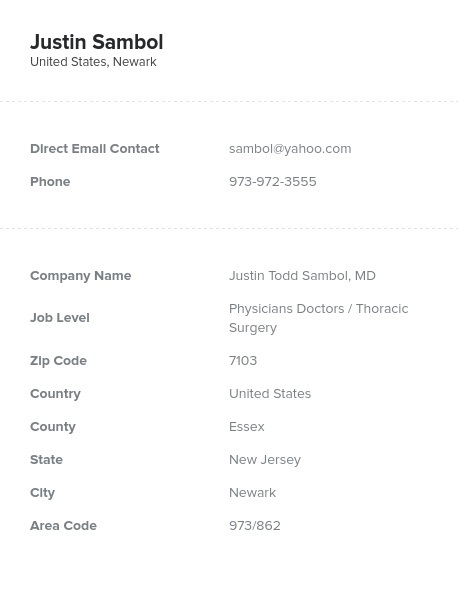 With this accurate lead list, you’ll be able to get the full contact information of thoracic surgeons at multiple hospitals and institutions. Thoracic surgeons work on the chest cavity (or thorax) and tend to treat issues concerning the organs in that area. They most often treat the heart and lungs but also treat other organs, such as the esophagus. This hard-working group of surgeons can treat everything from a full cardiac arrest to a failing lung to simple swallowing disorders. They have a difficult and fast-paced job full of risks and difficulties. If you have a medical device, new product, or recommendation that can help them do their jobs more effectively, let them know with this directory. This vast database consolidates a spread-out group of thoracic surgeons from across many clinics, hospitals, and organizations into one lead list. It's perfect for marketing your medical products, whether they be a pharmaceutical, a line of medical supplies (such as scrubs and masks), or the newest equipment and medical technology. Being able to market to this group means that you'll be able to get to the heart of the matter quickly over email, a phone call, or through mail. Buy this list today and start marketing to medical surgeons who work on the thoracic cavity. Connect and network with this group easily with our downloadable directory!